What is a subscription delivery box? In general, it’s a type of online service where you can subscribe to the plan of your preference and receive a box containing goodies and specialty items. The box is sent by mail, directly to your doorstep. 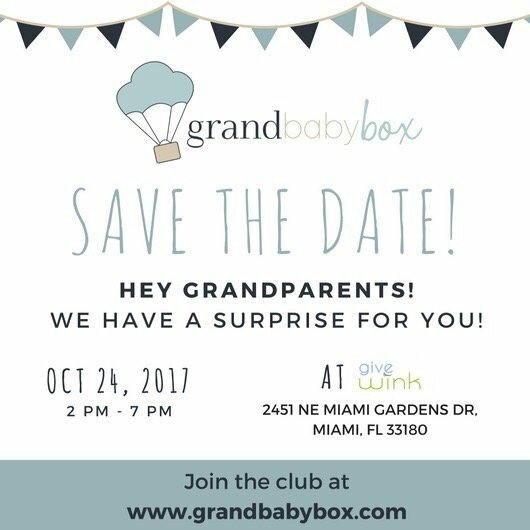 What is Grand Baby Box? It’s a subscription delivery box oriented to grandparents, which offers 4 to 5 items or products that you can use during your grandkid’s play-time, sleep-time, feeding-time, bath-time and any-time! We are very proud to be the first delivery box of this kind. Who founded Grand Baby Box? Grand Baby Box was founded by mompreneur and baby product expert Francine Delarosa. Originally from Colombia, she is the owner of Give Wink located in Miami, Florida; a very unique boutique-style store for babies & kids, where you can find specially curated items that are meant to make any parent’s life better, richer and meaningful, as well as promoting the healthy development of children. With this concept in mind, Francine is also the in-house designer of custom-made nurseries and child’s rooms. From personalized wall decor, gear and furniture, to educational toys, feeding items and products just for moms, Give Wink is the one-stop shop for anybody looking for the highest quality, most innovative and useful products in the industry. How many items come in a box? Between 4 to 5 products meant to be used during the basic activities of grandchildren. These products are not full-sized, are not samples, and most of the times are not consumables (for example snacks, shampoo or diapers). What is your selection based on? What determines the products that go inside the box is the grandkid’s age and gender. The included products are meant to be used by newborns up to 3 years old children. Grandparents can also choose between girl, boy and neutral. Our selection is hand-picked by our expert team, always having the grandparent in mind. Our mission is to make you the best grandparent you can ever be, bringing you only the top essentials to take care of your grandbaby, as well as the coolest playtime activities and games. Your first box is delivered two weeks after your subscription. Then you will follow the regular cycle of deliveries, which is once every two months (bi-monthly). Yes, of course you can! Visit Get Started and pick the proper plan in order to send your one-time only special gift! How does Grand Baby Box work? To start receiving our super fun boxes, you need to subscribe to our platform. Please visit our section Get Started, choose the subscription plan that best adapts to your needs, select age and gender, fill out your personal and credit card information, as well as a valid email and password. That’s it! Can I choose or switch out the items in my box? We don’t offer this option, mainly because we are experts in the baby product industry and we know exactly how to prepare the perfect box for you. We know the brands perfectly well, and we’ve taken the time to test them in real life, and make comparisons. When we conceive your Grand Baby Box, we make sure to avoid repeated items, products that are not reliable or unsafe, or unnecessary things. We’ve really tried them all, the good and also the bad, and what you’ll receive is exactly what you need at its best. How much is your subscription box? Very simple, $49.99 every other month and you can cancel at any time. How long does it take my box to be shipped? It takes 2 weeks for the box to ship. You can disable your auto-renewal at any time. There are no refunds available, however you can cancel at any time. We ship for free all across the US.